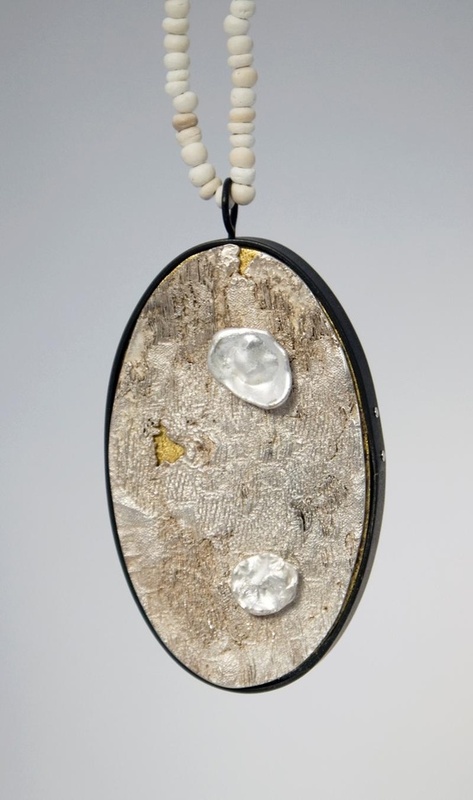 Shibumi Gallery is pleased to present an exhibition by Sacramento/Bay Area based artist Maya Kini entitled Silk featuring jewelry made using silk, silver, bone, gold, steel, and enamel. The opening will be held Saturday February 2nd with a free reception from 5-8pm and artist talk beginning at 5:30pm. Silk runs through March 31, 2013 at Shibumi Gallery. that imagines all objects to be linked to one another. Her exhibition of these pieces is an open-ended invitation by which she offers the gallery patron the opportunity to enter into the lives of these objects and continue with their story. Maya Kini received her MFA in Metalsmithing from the Cranbrook Academy of Art in Bloomfield, MI and her BA in Spanish Literature from Reed College in Portland, OR. Her work was recently featured in the exhibition Maps and Mapping at Tangent Gallery in Sacramento, CA (2012) and internationally at Galerie Louise Smit in Amsterdam, Netherlands (2011). Her work can be seen in a number of publications including 500 Rings Showcase, Lark Books (2012) and The Compendium Finale of Contemporary Jewellers, Darling Publications (2008). She currently maintains a studio practice in Sacramento, CA and is an instructor at the University of California Davis Craft Center, Davis, CA.